You are at:Home»Herbs»Solanum nigrum Linn. Latin name : Solanum nigrum Linn. Description : The whole plant is alterative, antiperiodic, constipative, demulscent, diaphoretic, diuretic, emollient, expectorant, febrifuge, hepatoprotective, hydragogue, narcotic, sedative and tonic. It is effective in the treatment of cirrhosis of the liver and spleen and is also credited with emollient, antiseptic and laxative properties. It has a protective effect on the liver and has shown hepatoprotective activity in cases of toxicity induced by drugs and chemicals. Useful in chronic enlargement of liver (hepatomegaly). 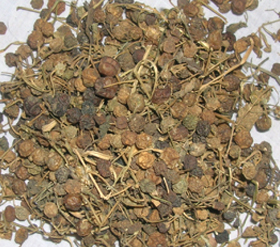 Also useful in heart diseases, skin diseases, piles, gonorrhoea and inflammatory swellings. Useful in cough and consumption. Recommended Dosage : 5 to 7 g powder of dried whole plant.